This paper describes a study funded by the Commonwealth Department of Climate Change and Energy Efficiency, and undertaken during 2010 – 2011 with the aim of improving capacity to assess coastal vulnerability to sea-level rise by building on existing tools including the Smartline national coastal geomorphic map dataset and the Coastal Vulnerability Index (CVI) previously developed in the USA. We assume that wave climate is most commonly the primary driver determining the physical behaviour of erodible shores, and further assume that past shoreline responses to wave climate will be a useful predictor of future response under conditions of rising mean sea level. We recognise that other factors such as tidal processes and regional variability in sea-level rise are also important factors governing shoreline response to sea-level rise, and seek to identify coastal environments in which these are equally or more important controls on shoreline response. Seventeen erodible shoreline study sites in both open and sheltered coastal environments were selected in Tasmania, the NSW coast, at Darwin, and in South Australia. Shoreline change histories on multi-decadal time scales at each site since the 1940s were mapped and quantified from time series ortho-rectified historic air photos. Swell and/or local fetch wave climates were modelled for each study site using SWAN and GREMO software respectively. 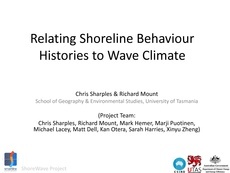 The historic behaviour of each site was compared with wave climate modelling to determine the degree to which wave climate can explain observed shoreline behaviour at each site. Physically meaningful and statistically significant relationships between shoreline behaviour and modelled wave climate indices have been identified at some sites, whilst results from some other sites have demonstrated that factors other than wave climate appear to dominate shoreline behaviour in those cases. The outcomes of this study will contribute to the development of indices of physical coastal sensitivity that are conceptually similar to but more reflective of actual coastal processes than the CVI, and will identify further work needed to understand the behaviour of shores dominated by processes other than wave climate.